We make contemporary sofas, loveseats, chairs and custom sectional couches that are comfortable, durable, space-saving, and almost always a perfect fit for your room. Each couch or chair is firm, medium firm or soft according to customer choice, and also made to the customer's selection from among many possible sizes. 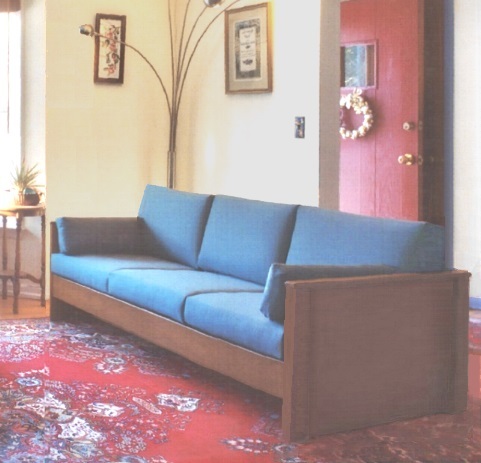 They are easy to re-cover, with optional exposed-wood sofa frames that are nearly indestructible. They can all be disassembled and reassembled to fit into almost any room. Our loveseats, chairs and sofas are non-bulky, compact and well suited for small and medium-sized spaces (unless you choose our large-scaled options), We make every couch design in your choice of many lengths, and our standard frame depth is only about 33" (30" and 36" depths are options). All of our furniture is made in America, which is increasingly uncommon; and that's only one of many features (described later) that contribute to the eco-friendly nature of our products compared with imports shipped in from the other side of the world. Our Custom 05 contemporary sofa model (shown above right) comes with our very wide range of custom options along with heavy-duty hardwood frame construction, high-quality cushioning, and relative ease of replacing the fabric covers. Click on this link to see more pictures, features, sizes and pricing of these upholstered contemporary custom sofas and chairs. Ease of re-covering, combined with extra-sturdy, solid-hardwood structure, means that this furniture is especially renewable, sustainable, very cleanable (with hundreds of our fabrics), and economical in the long run. Each couch, loveseat or chair is made to order in your choice of thousands of fabrics (or provide your own), and many optional and custom dimensions are available for these couches. Also, every wood sofa or chair can be ordered in your choice of many wood stains that produce a mild grain effect. The structurally important parts of the exposed wood as well as the interior structure of every sofa are solid oak wood. Distinctive Contemporary Wood Sofas and Chairs: Our California model. This wood sofa model is especially adaptable to many different decorating schemes, depending on your choice of fabric and wood finish. It's also one of our two most practical models, for ease of changing covers. Shown: 80" sofa, with optional padded arm wraps. Click on the following link to see more pictures, features, sizes and pricing regarding these California model contemporary wood sofas. 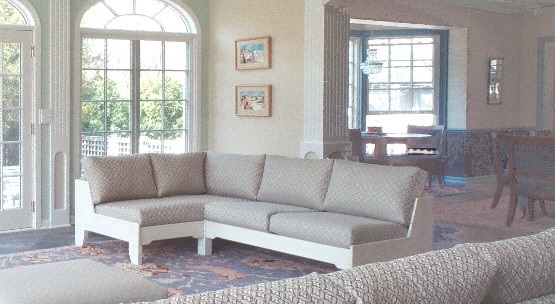 Southwestern, Country, Scandinavian, or Contemporary Sofas: Our Virginia model. Shown at right: 59" loveseat (one of several two-seat sizes), and below: 83" sofa, one of several three-seat sizes. Click on the following link to see more pictures, features, sizes, pricing and other information about these Virginia model Scandinavian-styled sofas, loveseats and chairs. We also make matching coffee tables, end tables, and ottomans in many standard sizes as well as in custom sizes. Sectionals can be made in any of the designs shown above, and in your choice of many sizes on each side. Our sectionals are especially popular with families, with people who have difficult-to-fit or very large rooms to furnish, and with people who are setting up home theaters. Click on the following link for other pictures and information (including examples of prices) regarding our sectional contemporary sofas, or go to that section just to see how our different designs, wood stains and fabrics fit into a variety of settings. Long-term economy resulting from outstanding durability and renewability: This relates to our nearly-indestructible construction combined with ease of replacing covers and cushions. Neatly-fitting replacement covers for one of our three-seat exposed-wood sofas (sorry, they don't fit other companies' sofas) are $210-$248, complete, in one of our base-priced fabrics, or in a range between those prices and up to $400 in a huge selection of fabrics (obviously, some fabrics are higher). If you know how much it costs to re-cover or reupholster ordinary sofas, and how often that would be needed in many cases, you can appreciate the long-term savings with this furniture. Replacement covers for our fully-upholstered sofa models would be higher than for our wooden-frame sofas, but still far less than neatly-fitting covers would cost for typical furniture. To read comments from many of our customers who have written us and purchased replacement covers and cushions after two and three decades of use, click here. Our furniture is especially well suited for sun rooms or sunny rooms, since most of our designs are more open and airy and less bulky than typical furniture. The fact that we can make these sofas, loveseats and chairs in a very wide range of different sizes helps assure that the best use can be made of the often-limited space in sun rooms. We have an excellent selecton of sun-resistant fabrics, and even if you choose a fabric that isn't especially sun-resistant, ease of replacing the covers can be very helpful in dealing with sun damage. Our furniture is also normally more substantial (and less ordinary) than the typical wicker furniture. Click on this link to see our furniture in sun rooms. Any of our sofa, chair and loveseat models and sizes can be made with the whole frames higher than normal, for the long-legged or for those with difficulty getting up. We also make less-deep (shorter front to back) sofas and chairs, for the short legged or for the space-challenged. Click on the following link for more information about high sofas, loveseats and chairs. Click on the following link for information about less-deep sofas, loveseats and chairs. If you like to keep up with evolving color preferences (orange this year? or purple? or blue? ), or even if you just want to modify your decor to create a bright, fresh look once in a while, keep in mind that with our furniture you can change the covers at very moderate expense. And, with our huge fabric selection, you'll almost certainly be able to find just the right shade(s) to go with the other elements of your decor. Our "Pet-Safer Sofa" is not one particular model, instead it's a sofa ordered with a set of options that makes it especially pet friently, such as shown here. 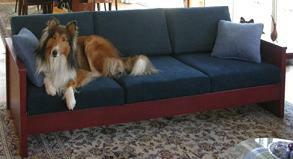 For more details about the practicality of our furniture with pets, click here. Our furniture is suitable for almost any hard use, while still being inviting, comfortable, and good looking. It's effectively contract furniture that looks and feels better than contract furniture, and it will probably also hold up better. Whether in a nicely-furnished fraternity house, or a well-used waiting room, or the TV room of a fire and rescue station, your people will be comfortable on furniture that lasts. To see many examples, click here. Any of our exposed-wood models can be made with an all-wood back, at an additional charge (except that in sectional sofas, we do not offer an all-wood back in the 32" square corner unit ).. This furniture is also unusually durable and practical for families with kids. For more details, click here. FABRICS as well as faux leather and (possibly) real leather: We offer heavy-duty fabrics in almost any color and in many patterns, as well as a huge selection of all kinds of fabrics, with swatches available on request- - (but your request must be specific). Our selection is probably wider than you can find from any other company, especially if you include the fabrics that you can see in our suppliers' web sites, and if you consider the fact that you can provide your own fabric. For more details, click here. 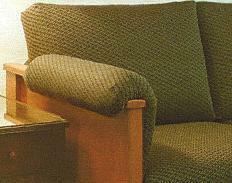 For some details about our cushion filling, comfort options, and reclining space, click here. Ottomans: We also offer matching ottomans, fully upholstered as well as with exposed-wood legs. One of our custom-size ottomans can also serve as a table or as a chaise longue , while allowing more flexibility of room layout than would be possible with a fixed chaise. For more information and pictures click here. Matching coffee tables and end tables that we make can be seen by clicking here. This is green (sustainable, environmentally-responsible) furniture: Buying our eco-friendly sofas and couches, by reducing pollution, waste of non-renewable resources, and unnecessary emissions of greenhouse gases compared with alternatives, is a very earth-friendly way to furnish your home. For details, click here.. If you have questions and don't care to keep going through this website to seek the answers, please call 1-800-659-0436, leaving a message and a number to call back if we aren't there at the time. Furniture for various kinds of rooms and for boats: Click on the following link to see pictures of sofas in living rooms. Click on the next link to see a grouping of pictures of our furniture in family rooms. Click on this link to see our furniture in lodge or log home settings. Click on this link to see our furniture in island home, second home or remote-access locations. Click on this link to see our furniture in sun rooms. Click on this link for info and pictures of our furniture for boats or yachts.. Warranties: Our furniture is covered by warranties that are far superior to what you will find from almost all other furniture suppliers. We offer a ten-day money-back satisfaction guarantee on our products , and beyond that a ten-year structural warranty and a ten-year supporting-quality warranty on cushion filling apply on all but the FineFit model. Full statements of our guarantees are in our printed product literature, available on request, and are also on this web site. To read them, click here. To read quotations from many letters and emails from our customers, with the original letters and copies of the emails available to be seen in our showroom on request, click here. Q: Do you offer recliners, sleep sofas or tables? A: No. In order to maintain reasonable efficiency and high quality, we have to specialize in the line that you see shown in this website. Q: Do you offer down/feather-filled cushions? A: No, for very good reasons. To read these reasons and to read also about our cushioning options, including "puffy" cushions (if you haven't already read that section), click here. Q: If it isn't convenient for me to come to your showroom, how can I tell how it feels to sit on your furniture? A: By means of a sample chair that we can send you, at no cost to you. See "sample chair" just above the "Fabrics" paragraph, 9" - 12" higher up on this page. Q: Do you offer storage options under your sofas? A: Yes. For details, click here. Q: Why isn't this furniture -- or furniture like it -- sold in normal stores? A: For the answer to this, click here. Q: Do you offer welting (piping)? A: No, for good reason. To read about that, click here. We don't offer: (1) sleep sofas, (2) slip covers or cushions for furniture that we haven't manufactured, or (3) anything other than sofas, loveseats, chairs, ottomans, and small tables. Since customers sometimes have a very hard time finding us a second time: If you like what you see on this web site, please bookmark it or write down our web address (www.comfy1.com) and a few words to remind you of what we are, and file it for future reference (stuck to the refrigerator door often works well). Or File/Save this page as a file to your desktop or other page where you can find it easily. Our furniture can be ordered directly from where it is made, without a middleman's markup. In addition to those who order by phone or e-mail (after requesting fabric and wood samples), customers are welcome to come (by appointment) to our Virginia workshop/showroom, 30 minutes off the scenic, major north-south artery, I-81, and two hours to the west-southwest of the Washington beltway. If you are outside our normal 3-4 hour direct-delivery range, be aware that we ship to anywhere in the U.S., at moderate cost (our furniture is well adapted for shipping, being easy to disassemble and re-assemble). Regardless of whether you order from afar or at our showroom, bear in mind our satisfaction guarantee (see above). For our company history, click here. -- 2) Check for warnings from dissatisfied parties (and sometimes kudos) that can often be found by doing a web search using (for your search terms) the company's name followed by "furniture," then bypass the websites issued by that company. There are also websites to which you can go directly to find records of complaints. Admittedly, while telling you this we are aware of only one unfavorable comment about us (on Yelp.com, from an elderly man who had unreasonably high expectations about appearances over the long term in parts of our furniture that are not exposed to normal view -- see our response to his complaint); we're very confident that we will keep such an essentially perfect record. If you're considering purchasing from one of our competitors, you owe it to yourself to do the following: Make sure you know the name of the manufacturer and that manufacturer's model name or number for the product you're considering, and go to that manufacturer's website to see specifics about how the product is made, including materials used and construction details regarding joinery and about any sections of the product that you aren't able to inspect before purchasing. This is important even for well-known brands, since some have been known to go way downhill during the recent cut-throat competitive market, with companies like Ethan Allen now making furniture of "engineered wood", stapled together. Also carefully read the fine print of the manufacturer's warranty, and consider how much you would have to pay to ship the product to and from the manufacturer to get any warranty work done. And of course you'd want to know the manufacturer's physical address, not just a post office box, and not just the address of an office that distributes furniture made on the other side of the world. If you don't look into the above, and especially if you can't do so because the manufacturer doesn't have a website providing this basic information, you are really taking a chance. For additional points to consider when comparing, click here. For more information (including printed): We can mail you free literature showing prices, sizes, fabric selection procedures, how to order, and other information if you call (1-800-659-0436), leaving a message on our answering machine if calling after hours; or else click on the link below to send e-mail, but we have heard of several cases of e-mail not getting to its intended recipient,, so it's safer to call. To send e-mail, click here. If this e-mail link doesn't work for you, our e-mail address is info@comfy1.com . Placing an order, receiving it, and payment: We require only a 10% deposit with orders. For details:click here.